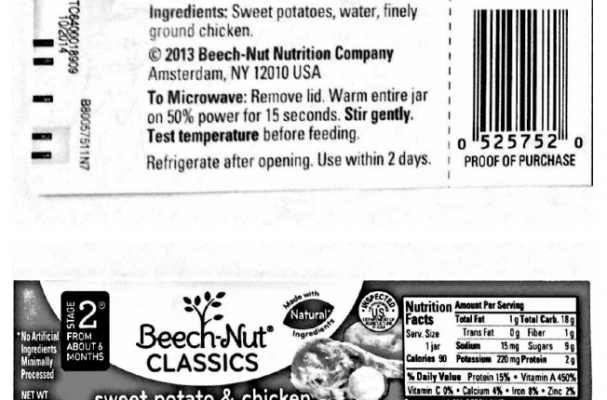 Beech-Nut Nutrition, an Amsterdam, N.Y. establishment, is recalling approximately 1,920 pounds of baby food products that may be contaminated with small pieces of glass, the U.S. Department of Agriculture’s Food Safety and Inspection Service (FSIS) announced today. The problem was discovered after the firm received a complaint from a consumer who found a small piece of glass in the product.The company has received a report of an oral injury associated with consumption of these products. FSIS has received no additional reports of injury or illness from consumption of these products. Anyone concerned about an injury or illness should contact a healthcare provider. FSIS routinely conducts recall effectiveness checks to verify recalling firms notify their customers of the recall and that steps are taken to make certain that the product is no longer available to consumers. When available, the retail distribution list(s) will be posted on the FSIS website at www.fsis.usda.gov/recalls.Consumers with questions about the recall can contact the Beech-Nut Consumer Hotline at (866) 674-4446. Media with questions about the recall can contact Jodi Breuer, Director of Marketing, at (518) 839-0183.